Ambassador withdrawn: Prime Minister Tony Abbott and Foreign Minister Julie Bishop address the media after the executions. Australia has recalled its ambassador to Indonesia for consultations after two Australians were among eight drug smugglers executed by firing squad early Wednesday. Australian Prime Minister Tony Abbott called the executions “cruel and unnecessary” because both men, Andrew Chan and Myuran Sukumaran, had been “fully rehabilitated” during a decade in prison. Abbott didn’t say what permanent actions, if any, would be taken against Indonesia. “This is a dark moment in the relationship, but I’m sure the relationship will be restored,” he said. The Abbott government faces the tough task of rebuilding Australia’s relationship with Indonesia following the executions of Bali Nine pair Andrew Chan and Myuran Sukumaran. All sides of Australia’s politics have united to condemn Indonesia’s decision to carry out the shootings, with Labor urging a stronger response from Canberra. Chan and Sukumaran were executed by firing squad alongside six other prisoners after midnight (3am AEST) in a field on Nusa Kambangan. The government’s reaction was swift, with Indonesia ambassador Paul Grigson recalled from Jakarta. Prime Minister Tony Abbott said contacts between Australian and Indonesian government ministers would remain frozen following the “appalling tragedy” overnight, but urged caution over threatened boycotts of the country by consumers. 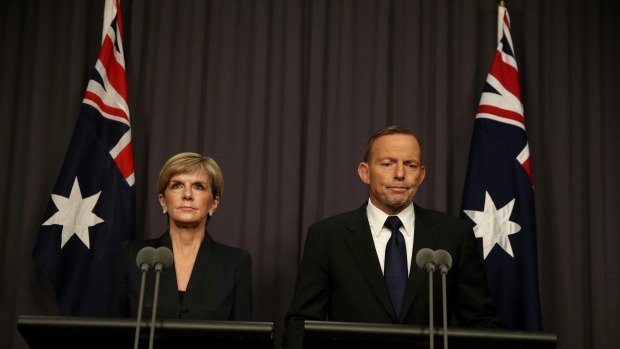 “Australia deeply, deeply regrets these executions in Indonesia,” Mr Abbott said in Canberra. “These executions are both cruel and unnecessary; cruel because both Andrew Chan and Myuran Sukumaran spent some decade in jail before being executed and unnecessary because both of these young Australians were fully rehabilitated while in prison. “Australia respects the Indonesian system. We respect Indonesia’s sovereignty but we do deplore what’s been done and this cannot be simply business as usual. For that reason, once all the courtesies have been extended to the Chan and Sukumaran families our ambassador will be withdrawn for consultations. However Mr Abbott cautioned Australians against overreacting with threats of economic boycotts targeting the country, describing himself as “a friend of Indonesia”. “I absolutely understand people’s anger. On the other hand, we do not want to make a difficult situation worse and the relationship between Australia and Indonesia is important, remains important, will always be important, will become more important as time goes by,” he said. Mr Abbott acknowledged that this was a “dark moment” in Australia’s relationship with Indonesia. “I want to stress that this is a very important relationship between Australia and Indonesia but it has suffered as a result of what’s been done over the last few hours,” he said. Foreign Affairs Minister Julie Bishop said that Australia’s ambassador, Paul Grigson, would return to Australia by the end of the week for consultations with the government about the future of Australia’s relationship with Indonesia. “The withdrawal of an ambassador is to register our displeasure at the way our citizens have been treated,” Ms Bishop said. While the Bali Nine have garnered much international attention, their punishment is part of a larger government effort to combat illegal drug trafficking. “We are fighting a war against horrible drug crimes that threaten our nation’s survival,” Attorney General Muhammad Prasetyo told reporters in Cilacap, the gateway to the high-security prison island of Nusakambangan where the executions took place. President Joko Widodo, who has been a vocal supporter of the death penalty for drug traffickers, also defended the executions: “This is our rule of law, the rule of law concerning the death penalty. We also respect the laws of other countries.” The seven convicts — two from Australia, one from Brazil and four from Africa — were put to death by firing squad early Wednesday, along with one Indonesian, despite strident international appeals and pleas from family members.